This occasional table was made in the Monticello joinery sometime after 1793. The uncommon ovolo-headed raised ornament on the legs imitates the decorative details on a Paris-made architect's table, which was brought to Monticello in 1793. 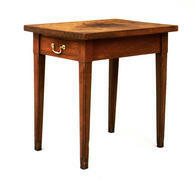 The table, with an unusually thick top and rather heavy legs, has a drawer with brass bail handle. The legs originally had casters (now missing). Dimensions 28 x 28 x 20 1/2 in.